Reflexology may be as effective as painkillers, according to a small study carried out by the University of Portsmouth. Researchers have found that people felt about 40 per cent less pain, and were able to stand pain for about 45 per cent longer, when they used reflexology as a method of pain relief. This is the first time this widely used therapy has been scientifically tested as a treatment for acute pain, meaning it may be used to complement conventional drug therapy in the treatment of conditions associated with pain such as osteoarthritis, backache and cancers. Participants attended two sessions, in which they were asked to submerge their hand in ice water. In one of the sessions they were given reflexology before they submerged their hand, and in the other session they believed they were receiving pain relief from a TENS machine, that was not actually switched on. The researchers found that when the participants received reflexology prior to the session they were able to keep their hand in the ice water for longer before they felt pain, and that they could also tolerate the pain for a longer period of time. Reflexology is a complementary medical approach, which works alongside orthodox medicine, in which pressure may be applied to any body area but is commonly used on either the feet or hands. In this study reflexology was applied to the feet. Dr Ebenezer from the Department of Pharmacy and Biomedical Sciences and Dr Samuel used a small study of 15 people to determine whether reflexology would be more effective than no pain relief at all. Dr Ebenezer said: “Complementary and alternative therapies come in for a lot of criticism, and many have never been properly tested scientifically. One of the common criticisms by the scientific community is that these therapies are often not tested under properly controlled conditions. “When a new drug is tested its effects are compared with a sugar pill. If the drug produces a similar response to the sugar pill, then it is likely that the drug’s effect on the medical condition is due to a placebo effect”. Dr Samuel added: “This is an early study, and more work will need to be done to find out about the way reflexology works. “However it looks like it may be used to complement conventional drug therapy in the treatment of conditions that are associated with pain, such as osteoarthritis, backache and cancers“. The study has been published in the Journal of Complementary Therapies in Clinical Practice. Local CNHC Reflexology practitioner, Heather Hull, is one of 63,000 health practitioners ready to help transform the nation’s health. The Professional Standards Authority for Health and Social Care has reported to Ministers that 63,000 health practitioners stand ready to help transform the nation’s health. Local Reflexology practitioner, Heather Hull, is one of them. Harry Cayton, the Professional Standards Authority Chief Executive, stated that we need to look for new ways to deliver integrated care fit for the 21st century. He called for people in charge of health and care services to use a wider range of occupational groups, including complementary therapies. Mr Cayton made the comments as the Authority published a report to Ministers on the Accredited Registers programme, the Government programme to promote safety and quality in a wide range of health and care services across the UK. The Complementary and Natural Healthcare Council (CNHC) is one of these Accredited Registers and Heather Hull is registered with them. The Importance Of Stretching And Movement - Fascinating Fascia! Like me, have you noticed that you feel stiff and achy when you first get out of bed in the morning? This is not necessarily old age creeping up on us, it is fuzz! What Do You Mean, Fuzz? When we are inactive during sleep fuzz builds up between the sliding surfaces of our bodies - the muscles, tendons, ligaments and fascia which are designed to slide and glide over each other to give ease of movement. This is why we feel stiff when we get up in the morning, the fuzz prevents gliding, which we feel as stiffness and possibly pain. The easiest way to get rid of fuzz and thereby avoid the increasing stiffness and discomfort experienced when fuzz is allowed to build up, is to gently stretch and move when you first get out of bed. If you have a cat, you will have noticed that they always have a long stretch after a period of sleep. Get A Move On And Get Rid Of Your Fuzz! For me, this will mean regular morning sessions on my Chi Machine - click this link for details and get rid of your fuzz! Click the link below to watch this fascinating short film presented by Gil Hedley, Ph.D., (Anatomy). Visit www.gilhedley.com if you would like further information. He is a fascinating person and has a knack for explaining complicated stuff in delightfully simple ways, with the added benefit of short films to assist with our understanding. Fifteen Years Of Happy Feet! Saturday 4th March 2000 was, and still remains, a very important date for me. It is the day on which I qualified in the Original Ingham Method of Reflexology with the International Institute of Reflexology (UK) in Sheffield; and gained my much-coveted Diploma. My interest in Reflexology had been sparked a few years previously, whilst having a series of aromatherapy massages. The therapist used a basic form of Reflexology on my feet prior to treatment, to determine which oils to use during the massage. The fact that she always seemed to know what was wrong with me or which part of my body was struggling at a particular time really fascinated me and I always felt the benefit of her work. A few years later, my own ill health (ME/CFS or Chronic Fatigue Syndrome) had caused me to lose my teaching job as a Secondary and 'A' Level English teacher and I was looking at ways of recovering my own health. Having learnt Reiki 1 and 2 for self-healing to try and regain my health, I eventually reached a point where I felt well enough to pursue my interest in Reflexology, sparked by those aromatherapy massages. I knew nothing about what would be a good course, so asked my Reiki insurer which courses he would recommend and be happy to insure graduating practitioners. I was surprised to learn that there were only three courses in the UK that he rated and the one that came top was the International Institute of Reflexology, which taught the Original Ingham Method of Reflexology. Conveniently, one of the trainers, Jennie Levick, was based in Sheffield, so I didn't have far to travel. The course was rigorous and very detailed. Not having studied Biology at school, I found the Anatomy and Physiology very demanding and I did struggle to retain information due to being in the last stages of brain fog from my ME/CFS. I have never been a quitter, but I came close to just that when my brain seemed to rebel over learning and understanding the digestive system! The practical side of the course was also thorough. We worked on each other as part of the course and I did fortnightly treatment swaps with other students to revise and perfect techniques. This benfitted my own health tremendously and has taught me the value of having regular treatment. Over the course of the year I went from taking one hour to treat one foot, to the complete and thorough treatment of both feet in an hour. Another course requirement was to submit one hundred hours of documented case histories, ie, ten treatments on ten different people, all of whom had differing health issues. Each treatment had to be recorded, graded, commented upon and an overall conclusion made as to how they had responded to and benefitted from, their course of Reflexology treatments. This was a massive undertaking but, by the end of it, I knew I knew my stuff, which then stood me in good stead for the practical exam. The much anticipated date of 4th March, 2000 eventually presented itself in the shape of a three hour theory paper on Anatomy and Physiology and then a one hour practical and viva exam with an assessor. As someone who has been through university, gained a BA Honours Degree and then gained a Post Graduate Certificate in Education, I am well used to exams; but the pressure of my Reflexology exams was huge and I can still recall the angst I felt on that day. Qualifying meant so much to me. It marked the end of a very dark and scary period of illness, having lost my job through ill health and feeling like I was on the scrap heap of life having got ill at the tender age of 34. It showed I could embark upon a completely new and different subject from scratch and become a competent practitioner. Over the subsequent fifteen years I have treated many different people from all walks of life, from children and teenagers to adults and pensioners. All have had particular health concerns they wished to address and it is a pleasure and a privilege to see how they benefit from Reflexology. I am even honourary Aunty to children who were conceived, grown and given birth to with the help of Reflexology! I still love seeing clients' health, relaxation and happiness improve and it is what keeps me practising Reflexology. Please try Reflexology.... I am confident you will love the benefits it brings! blog, blogspot, chronic fatigue syndrome, cfs, Reflexology, IIR, AOR, VRT, FFR Cert, International Institute of Reflexology, Association of Reflexologists, VRT treatments in Sheffield, Vertical Reflexology treatments in Derbyshire, Finger Free Reflexology, holistic therapies, complementary therapies, alternative health, relaxation, wellbeing, health, peace, calm, wellness, stress reduction, pain management, mobility, spiritual development, personal development, in Sheffield, Bradway, Dore, Totley, Nether Edge, Ecclesall, Norton, Meersbrook, Crookes, Walkley, South Yorkshire, Dronfield, Holmesfield, Coal Aston, Eckington, Derbyshire, Chesterfield, Brimington, Hasland, Newbold, East Midlands, Peak District, Hope Valley, Hathersage. Are all Reflexologists qualified to the same high standard? There is a world of difference between someone offering 'foot massage' and a highly trained and skilled Reflexologist who undertakes annual CPD training (Continuing Professional Development). I am qualified in The Original Ingham Method of Reflexology, having passed the official course run by The International Institute of Reflexology. As a result, I use the letters MIIR regd after my name to show this. I am also registered with The Association of Reflexologists, designated by the letters MAR after my name. An MIIR registered practitioner is trained to the highest standards and governed by a strict code of practice and maintains suitable practitioner insurance cover. See 'Family Footsteps' for further details. The IIR course is the only internationally recognised reflexology course and is officially recognised by the British Government. 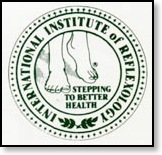 MAR - I am a registered member of the Association of Reflexologists. I am an affiliate member of the Vertical Reflex Therapy (VRT) Network, having received Authorised VRT Tuition. Having trained in Finger Free© Reflexology with its founder, David Wayte, I am a certified practitioner (FFR Cert). I am a registered member of the Complementary & Natural Healthcare Council. WARNING: always check out the qualifications of a practitioner you are thinking of using, to ensure they have followed a suitably rigorous and demanding course such as the IIR's. Initial consultation and treatment (1.75 hours) £45. Subsequent treatments (1.5 hours) £40. Gift Vouchers are available for this treatment.